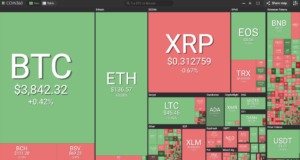 StockChain (SCC) 196%, HDAC (39%), Aurora (AOA) 23%, NEXO (15%), Cortex (CTXC) 12%, XYO Network (XYO) 11%, Pundi X (NPXS) 10%. 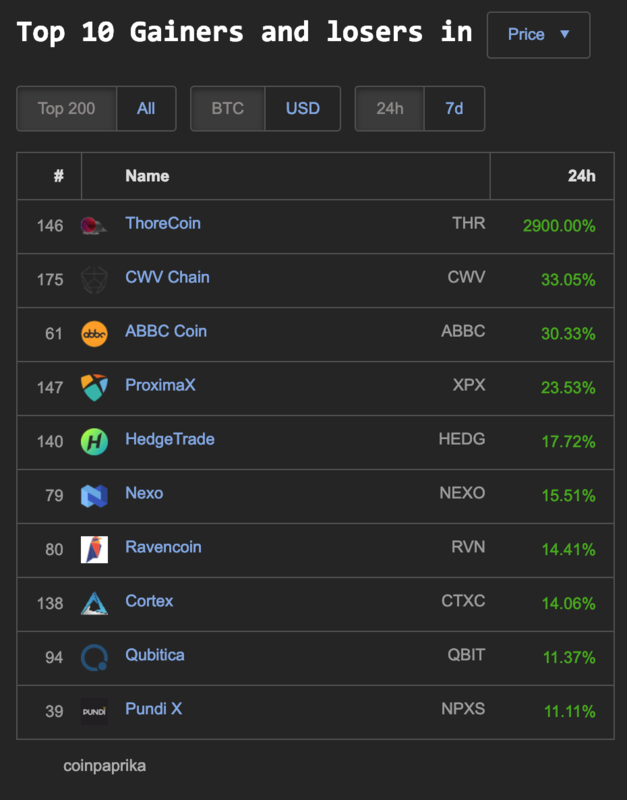 The cryptocurrency leaders on Coinpaprika’s top 200 coins by marketcap. 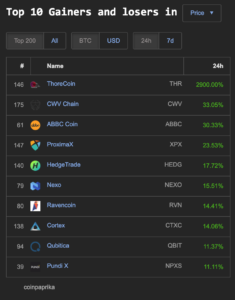 Coinpaprika.com has 10 coins with double digit gains within the top 200 market cap with ThoreCoin (THR) gaining 2900%. 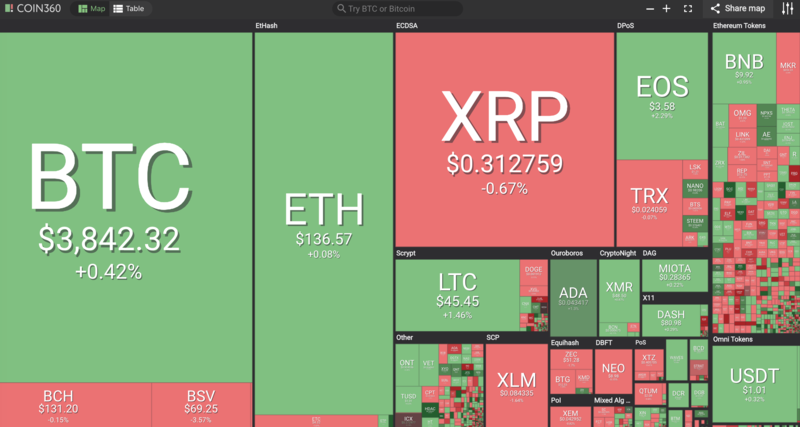 ThoreCoin is not a single coin, but in reality is like a mini ETF that is a basket of coins, which particular coins is still unknown to me. 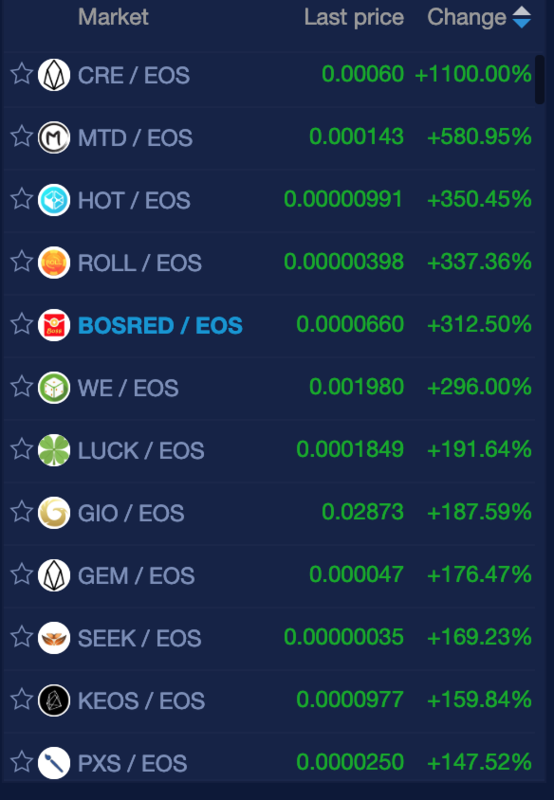 No surprise on newdex.io coins trading with EOS are the winners of the cryptocurrency market so far today by another huge margin with twelve coins with over 100% triple digit gains and one with over 1000%. 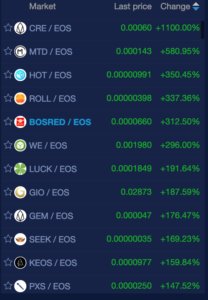 Non Gambling/Gaming standouts include BOSRED offering pan-block chain payments for small and micro enterprises, and PXS, which at the moment is primarily used as a game token for a competitive cooperative online multiplayer drawing game, but will soon allow creative artist types to claim/sell their artwork on the blockchain.